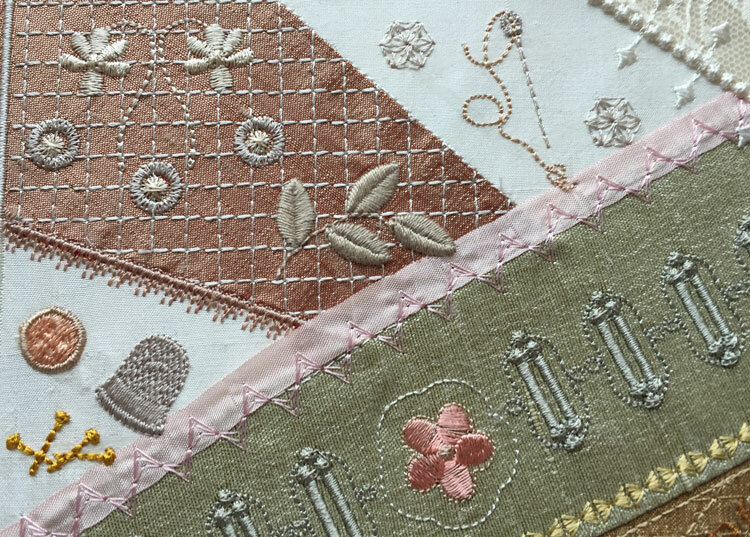 a thimble, some pins, a threaded needle, a row of buttonholes, press studs (snaps), buttons and cotton reels, along with some lovely embroidery stitches, motifs and flowers. As I did my first stitch out several ideas came to mind and I will test them out in my subsequent stitch outs. 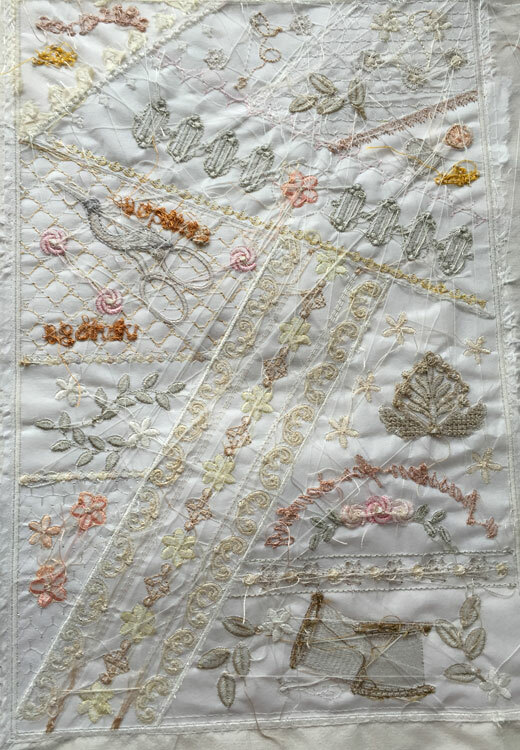 I would like to share the results of this first version (which will have some editing before it is complete) including the mistakes that I made, so you can avoid them when creating your crazy quilt block. One of the most important choices you have to make are the colours of fabric and thread that you use. I was unhappy with several of my choices. 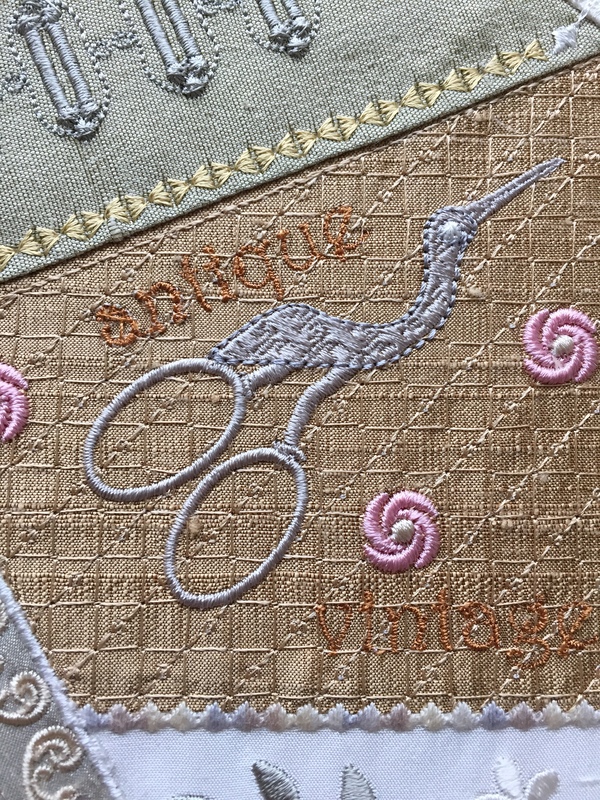 Now this mid tan silk does not go with the silver scissors and is too dark for the lettering which says “antique” and “vintage”, but I was delighted with the Mettler silk finish cotton multi 50wt thread 9854 which I used for the seam covering in the lower part of this picture. Although not a great fan of variegated thread a subtle variegation helps in giving a vintage look. This photograph shows the ornamental button holes, which can be used for threading ribbon, and the threaded needle, along with a press stud. I layered silk duchesse satin and lace for the right hand corner and it worked well. 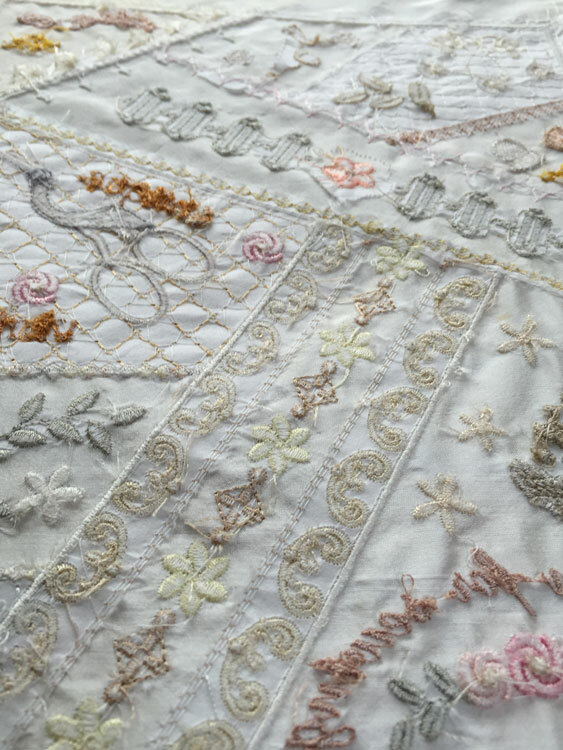 (I now have the idea of a Bridal Crazy quilt in the future) Crazy quilting allows you to use those precious tiny remnants of expensive fabric that you have been reluctant to part with, so they can be displayed forever! The join that has the silk ribbon did not work well, probably because I choose too wide a ribbon and was not careful enough in its positioning. I will add a row or two of alignment stitches to avoid this happening. I choose a gold thread so the pins look like old ones but maybe it was a little too bright. Look at these peach flowers which are flat with poor coverage, as I did not add underlay which is so important in all my designs. Obviously I quickly added these necessary stitches to the design. 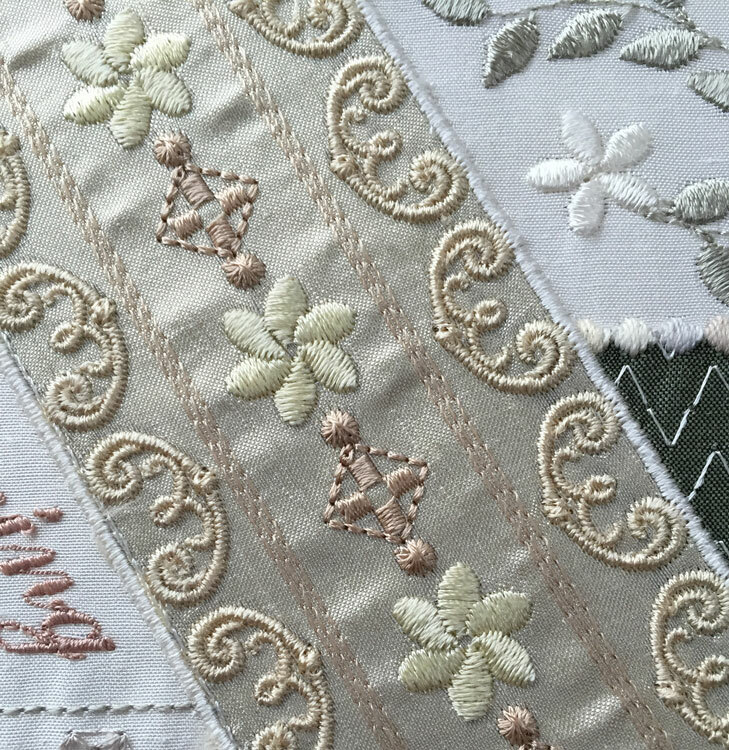 The grey green silk was just a little too dark but it is interesting that despite using Sulky Rayon 1071 off white as the motif fill stitch over this fabric, it looks like a pale green. Be aware that light threads can become darker when sewn on dark fabrics, especially if they are just small areas of stitches or the equivalent of running stitches. 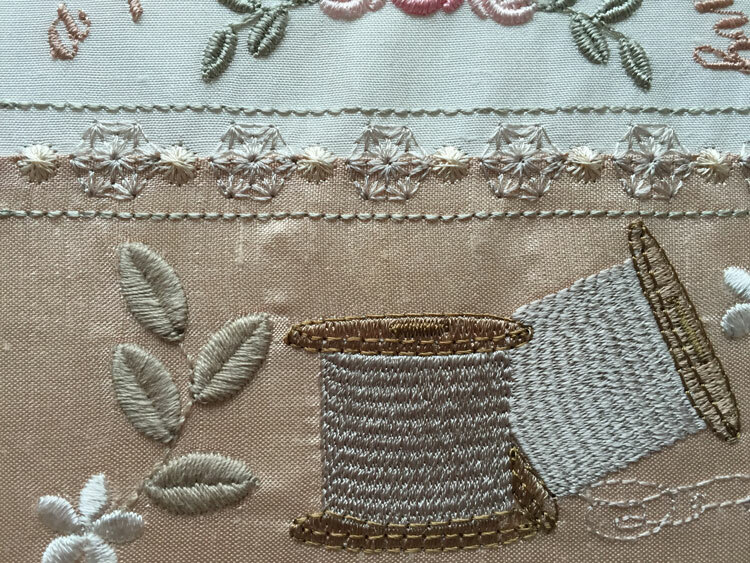 The beige motif in the top was stitched in Mettler Silk finish 40wt cotton 1222 and the border that crosses the right hand side of this photograph has now been widened to allow better coverage of the raw edge beneath. This is quite a large panel and perhaps should have been better stabilised to avoid puckering. I only used one layer of stitch and tear for this particular stitch out. The left hand lower corner segment has some vintage reels of thread and a row of press studs across the top! The larger leaves have also been stitched in Mettler Silk finish 40wt cotton 1222 too, and as the silk fabric is darker I added white flowers to give contrast. Here you can see the panel around which the whole block is based. It has a combination of scroll work, flowers and motifs. 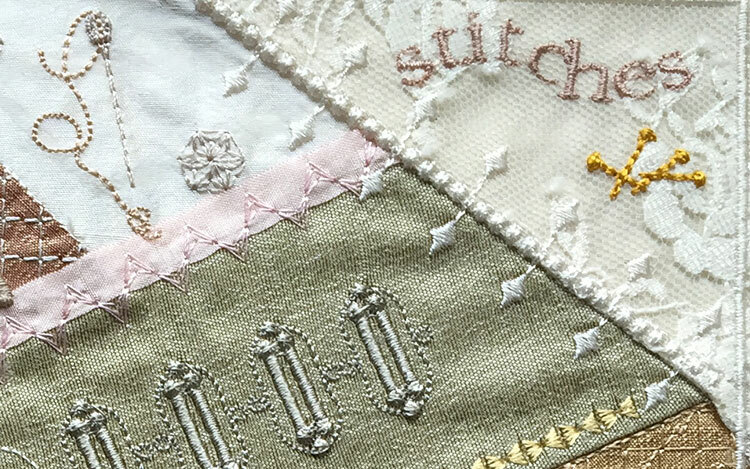 In all previous quilt blocks, all the fabric sections have added first before the embroidery but for this block I have changed that so the panel is completed earlier on in the design sequence. This results in a better finish for this block. Before I show you my completed block I would like to turn it over and show you the back. I really think too little is said about the back of embroidery and how we should finish it off. I use a seam ripper to help me tear away the small areas of stabiliser, placing the point of this tool under the stabiliser with the blade uppermost. This helps lift the stabiliser away in the tricky areas but be careful not to catch the fabric. 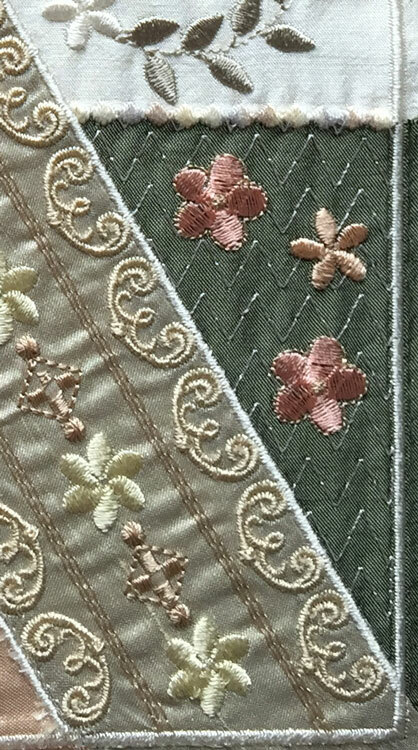 Another word of caution; be aware that there are large stitches on the back of the motif fills which cover some of the fabric segments and you must not trim or catch these. As you can see it is not possible to remove all the stabiliser but it is surprising how much can be worked away. The more stabiliser you remove from any design, the better your finished embroidery will look and puckering will be less likely. See how much better the back looks after spending some time on it. At this point I press my work on the back into a special mat which protects velvet or a terry towel, so the embroidery is set on the back but is proud on the front. 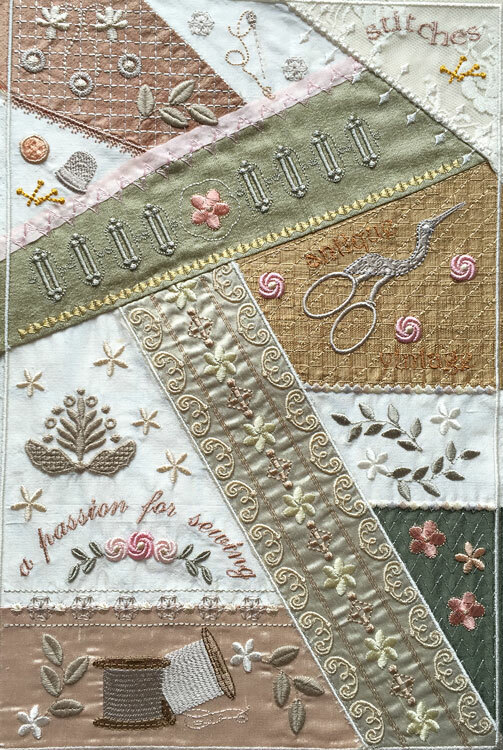 This Romantic Crazy Quilt #10 stitches out in a 12″ by 8″ hoop and will have a smaller version for the 5″ by 7″ hoop. It is available to pre order now and I hope to release them around April 16th, 2016. Between now and then I hope to create at least two more of these blocks and start embellishing them too! I think this block would look great made into a bag. 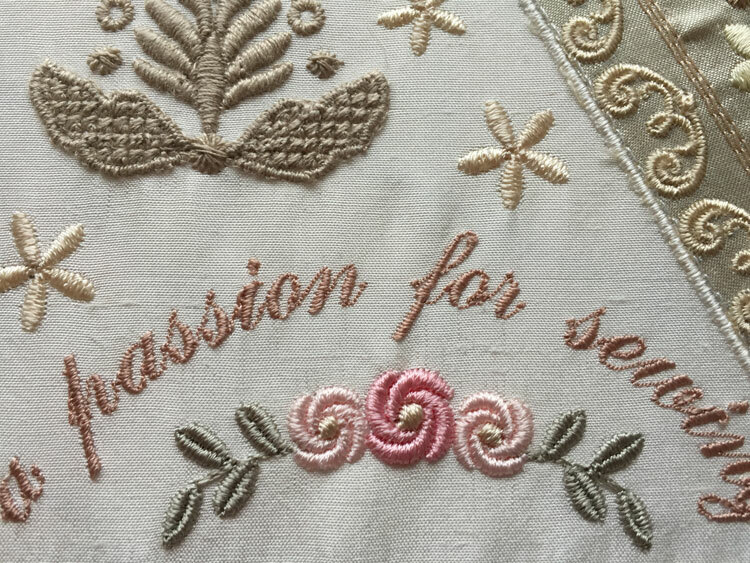 This entry was posted in Discussing machine embroidery, Embroidery projects, New Designs and tagged Crazy quilting, development of embroidery, embroidery on silk, machine embroidery, quilt blocks. Bookmark the permalink. Wonderful hints Hazel, you are so thorough!! A word to the wise though, people on the other side of the Atlantic, for the most part, don’t understand what a press stud is, they know them as snaps !! Thank you Carol. I have added a little explanation in brackets. I really appreciate you telling me. All the best. Ha ha ha, yes, press studs. I was reading instructions for making something in an Australian publication some time ago, and I puzzled over that one for QUITE a while! Once you know, it makes perfect sense, but at the time I just could not visualize what they could be. Thanks for the “translation”. Yes Becky, when I first came to Canada, people would look at me strange when I mentioned press studs….. didn’t take too long to find out what they called them and started using their phraseology. All your designs are elegant on the luxury fabrics you use. Thank you for the tips and beautiful images and the time it takes to make these newsletters. I’ve taken to the buttonholes. Ever thought of making these quilt block elements into individual designs? That was a very good mini tutorial Hazel. I always worry that my backs have so many long threads and I wondered whether it was just me, so I found this was very instructive. Thank you for the time you spend explaining things to us. Your quilt blocks are soo beautiful. I’ve been reading all you tutorials about the crazy quilt blocks. One quick question I have is, besides the link for the silk fabric, are there any other places you can recommend for some of the embellishment that you use.? I can find seed beads and even some of the small metal pieces, but other things like little buttons and tiny hearts , that type of things. Any suggestions? 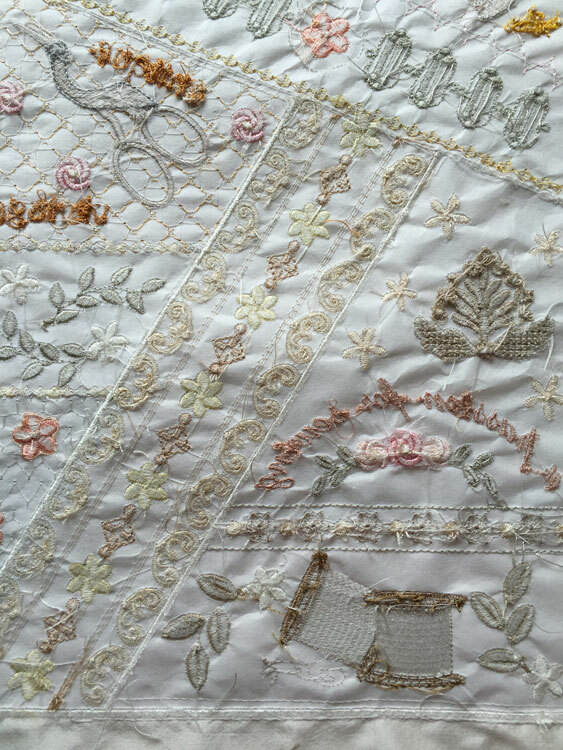 Finding the little buttons and hearts along with other suitable items to attach to your Crazy Quilt can be a challenge. They do not seem to be readily available. I am always on the look out. I used http://www.crazyquiltingsupplies.com/ but the website is not available at the moment. When shopping online check the sizes of everything carefully. Be always on the look out at craft shops too. Check out the scrap booking section. If anybody else has ideas let us all know. Thank you Hazel, I will save both web addresses. Hopefully someone else will chime in as well and we can all find more resources. I’ve actually asked friends to check on clothing they may be discarding for fun items to save. Never know what I’ll come up with! Thank you again!